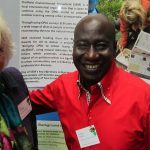 SEM’s Maxwell Ayamba had the honour of meeting two of Britain’s top Paralympians – Jessica-Jane Applegate MBE and Emma Wiggs at a special event in Sheffield hosted by The International Sports Federation for Persons with Intellectual Disability (INAS). Both athletes spoke of special instances of the personal transformation that occurred during their journey in life through water sport. However, what stood out was the fact that they attributed these achievements to the close bond they developed with nature – in this case water, where they found peace and developed a sense of freedom to express their innate talents and qualities. 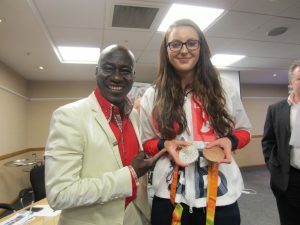 SEM’s Maxwell Ayamba meets multi-medal winning paralympian Jessica-Jane Applegate MBE. 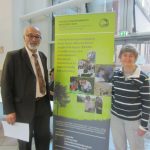 The ecotherapeutic benefits associated with nature which SEM is actively promoting through its environmental work according to Maxwell has been well documented in numerous studies. “The person engaging in a therapy forms a therapeutic relationship with nature just as they will do with a therapist. This leads to a bond both aesthetic and healing benefits that are formed during active engagement utilising resources in natural settings”, noted Maxwell. 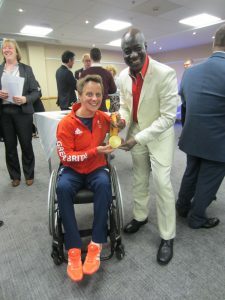 SEM’s Maxwell Ayamba meets gold medal winning paralympian Emma Wiggs. Maxwell explained that being in tune with nature leads to the rise in levels of confidence, trust in oneself, pride, self-worth and improved self-esteem alongside good mental health status in areas such as stress, anxiety, depression and mood management. This is because in nature people are bound to experience a sense of physical and psychological well-being, a sense of synergy with nature and freedom in the outdoors.